I spent the weekend hanging out at Blue Moon Glassworks, enjoying many glass friends and a long session of glass working without the heat. When I work at home during the summer, the torch and kiln make the worst summer in history almost unbearable, with working temperatures around 100° at best. I make one bead, then I'm drenched and drained. No wonder I do other work more during the summer. This class was dedicated to sculpting birds, lifelike and otherwise, so clearly just the thing for this bird fanatic. On the first day, we learned the basic process of constructing the birds. Having no torch time lately put me in serious unskilled status. 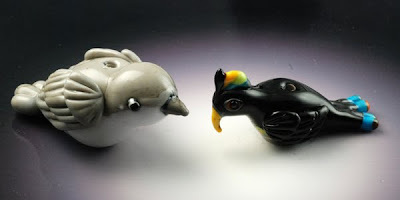 The first bird was one problem after another -- forgot to put all the different transparent colors on as suggested so that it was hard to see what I was doing, cracked it three times, broke it loose from the mandrel twice. I view it as a success because of my first successful bridge experience, building a glass bridge from the freely twirling bird to stable bead release. The second bead of the day was a bit more to my liking. The owl still has a few issues, but at least I didn't crack him! (Please pardon the uncleaned holes!) Fat and stubby maybe, but he was my favorite from class. 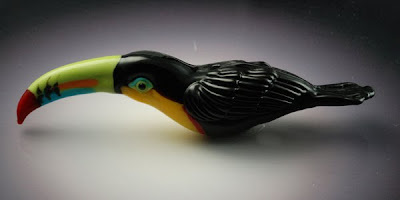 In the evening, Kim demoed a toucan, like this one that I bought from her. Isn't he amazing?? He will have a log to perch on, with delicate blue feet, just as soon as Kim makes one for me. I think I will hang him in the window over my computer. On the second day, we made another bird with more markings, starting with a transparent core and thin encasing. For whatever reason, I made error after error. I started off too big, so everything was big, longer, harder. I put the color rings around the mandrel on reversed. I used the horrible devitrifying black, which caused the grey head to devit. I put on wings that were too small, so then I put a second set on over the first. I was unhappy with the tail, so played and played with it until I cracked the head. Then I had to peel the face off and sloppily repair it. Then I cracked the tail doing all that work. This was the closest I've ever come in class to dunking a bead in the water. 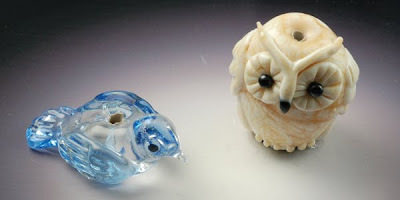 The second bead was a fantasy bird. At least he was a reasonable size, with no cracking! Now, I'm back to metal clay and painted sheet glass to avoid the heat again. I've got new ideas for some of my beads, whenever I can really try them out. The birds are so beautiful !!! !